Comparison is a key to understand data and trends. Keshif's unique lock-selection design allows you to select and compare trends across multiple groups (aggregations, or features) of your data immediately. For example, you can compare trends in surveys responses by demographics (such as by gender and age), countries by region, events by location, resources by category, and transactions by value, in just a single click! How to lock a specific group? Mouse-over an aggregate to highlight it. Click the lock icon (or, shift+click) on this aggregate. Click the locked attribute name on the top panel to remove all locked selections at once. You can lock up to three selections for comparison. When you try to make a fourth selection, Keshif will guide you to remove one of the active selections. This limit is to ensure effective perception and analysis of data, as comparisons across too many groups will be harder to read and understand. You can only compare data groups from a single attribute. For example, you can compare people in different age groups, or different states, but you cannot compare an age group vs. a state group. With a locked selection, Keshif also disables highlight selections in other data features to ensure all selections remain meaningful. You can analyze data with the relative-distribution feature once you have a lock-selection. You can compare trends visually using two chart designs: Stacked, or side-by-side. Learn how! You cannot make selections when in dashboard Adjust mode. Once you lock a selection, it will be assigned a unique color across the dashboard. The top section in the dashboard will show the features you have selected with the unique colors assigned to each. This will guide you as the dashboard color legend. 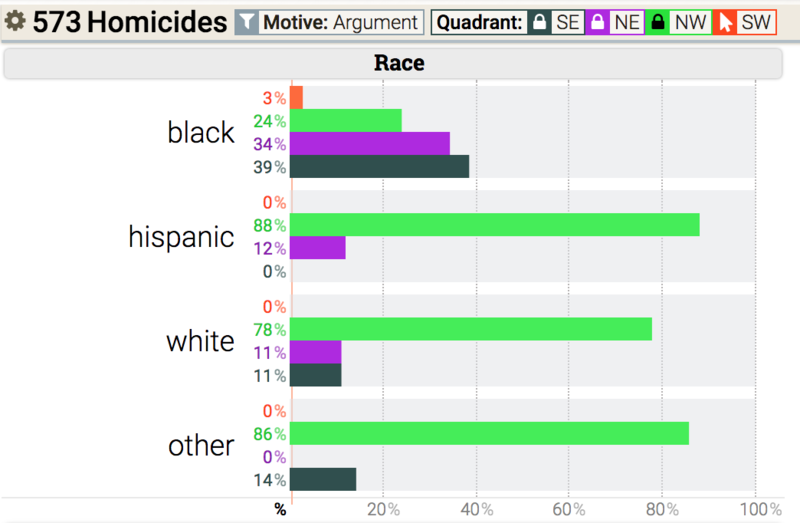 The chart above shows the racial distribution of 573 homicides with motive argument (filter), separated into four different colors showing different regions (Quadrants). Each locked (compared) region is noted by its colored on top section to help you read this chart. In bar charts and histograms, each compare selection is shown with its separate bar, side by side. In line-charts, each comparison gets a separate line trend. By default, categories are shown in a compact size with a single text label. To show multiple labels, open the chart configuration, and set row height into a value that can support multiple selections. For example, 3x supports 3 labels, up to 2 locked selections. You can also move the mouse over a compare selection block in the charts or the top-panel, and the text labels will be updated to reveal the numbers specific to that feature of your data. You can also lock the "empty/no-value" aggregate using shift+mouse click.